Casting Territory: A Contemporary River Keepers’ Index of Lesser Known Patterns, was a collaborative art project by The Dodder Anglers Club and artist Martina O’Brien, which utilized the art of fly-tying to explore the angler’s unique knowledge of flora and fauna, physical geography and role as guardians of the River Dodder. 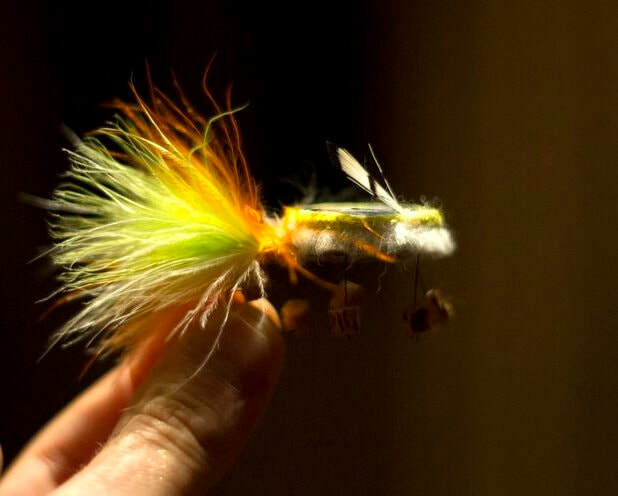 Fly-tying, known as a fly-dressing, is a precise skill. Traditionally he or she has to represent, insects, often complete atomies of changeable shapes and hues by means of the most delicate substances of varied feathers and threads. The fly-dresser must be acquainted with the outward appearance of several sorts of insects and know the divisions of the seasons in which they live and cease to be; he or she must know the climates and localities peculiar or otherwise to each species. Enabled by a process of exploration by the artist and the group into the fundamentals of imitation in conjunction with specific accumulated knowledge, the angler’s’ insight into the river was visually conveyed within these alternative flies. Exhibited simultaneously at RUA RED’s Pop Up Exhibition Space, the Royal Dublin Society Library, Ballsbridge and Waterways Ireland Visitors Centre, Grand Canal Quay, Dublin, during the month of February, these artworks suggested a loose alternative to the line of public monuments that appear along the length and breadth of the rivers’ axis. This project was accompanied by an essay by Dr. Karen E. Till, Maynooth University, Director of MA in Geography. Casting Territory was supported by an Arts Council Artist in the Community Scheme Project Realization Award managed by Create, National development agency for collaborative arts. 21st of February, Collaborative Discussion with Dr. Karen E. Till, Maynooth University, Director of MA in Geography, Katherine Atkinson, Professional Development, Create, Martina O'Brien and The Dodder Anglers, 10am-1pm. This event will start in The RDS Library and Archives, Ballsbridge and involve a walk to The Waterways Centre, Grand Canal Quay.